One of the key things that I have learned from promoting my own content online is that if you share the content of others, there is a good chance that when you publish content, they will be more open to sharing your content too. I believe a lot of the time this could be related to the principle of reciprocity. 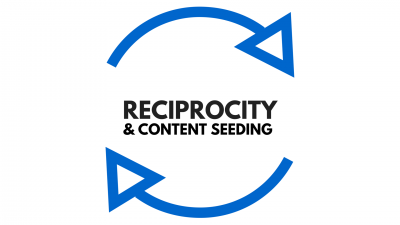 The principle of reciprocity has been around a long time in marketing, and it basically plays on the human need to return the favour. An example of this was highlighted in a social experiment that showed that when waiters gave patrons a free mint along with their bill it resulted in bigger tips. Bottom line is, if you are kind to other people, there is a good chance they will be kind to you in return. I go into a bit more detail below about specific techniques to help seed your content and encourage others to share. During the early days of SEO, reciprocal linking was all the rage, but this tactic has become quite dangerous, and Google has pointed out that this could be in violation of their webmaster guidelines. Now that SEO has shifted to a more content driven approach, the reciprocal model has been tweaked slightly, and digital marketers have started forming groups for the sole purpose of promoting each other’s content. These groups can often be found on Facebook, Slack, or as Bas Van Den Beld pointed out to me recently, Google+ communities are a secret goldmine when it comes to content seeding. I’m not particularly active on Google+ anymore, but using it as a way to seed content makes a lot of sense, as it is still quite an appealing platform to many digital marketers. If you are not yet a member of one of these groups, you should probably start asking around. If you can’t find a suitable one, then why not start your own and invite other people to join? Once you join one of these groups, make sure that you share the content produced by others, and make them aware of what you have done. This will increase the chances of others sharing your content in the future. Sites like Reddit, and digital marketing specific sites such as Inbound.org, can be an extremely effective way to seed your content. Unfortunately, if you are new to these communities it can be extremely difficult to gain traction on these sites. A great way to increase the chances of your content doing well on sites such as Inbound.org is to dedicate some time to interacting with the community, especially with key influencers. 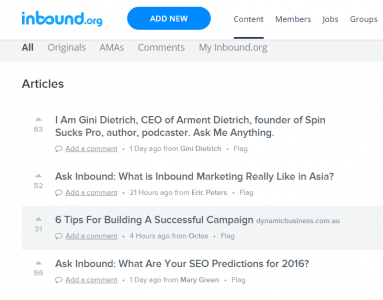 Inbound.org allows you to view members in order of ‘rank’. This is an extremely simple way to find key influencers within the Inbound.org community. If you decide to upvote a piece of content, make sure that you connect with the person that produced it, and make them aware that you have upvoted their piece. This will increase the chances of them returning the favour for you. It is probably worth mentioning that it’s usually against the rules to explicitly ask your friends to submit or upvote your content on sites like this. If someone is kind enough to share your content, make sure to take the time to thank them. Whenever I put out a piece of content, I often search for it on Twitter and try my best to thank everyone that has shared it. I also like to try and pay attention when they publish their own content too, and share it or promote it on social voting content sites. If you find that certain people have a wide online reach and they find your content useful, compile that data into a spreadsheet and approach them in the future if you need help seeding a new article. Be careful with this though, as it can be annoying to constantly bombard someone by asking for favours. If you are new to producing and promoting digital content, it can be extremely difficult to gain any traction, but the process gets easier as you start to build your reputation within the community. Creating genuinely good content is never enough; you need to make sure that your content is promoted in the right places by the right people. If you are sharing the content of others, and interacting with and adding value to the digital marketing community, then when you need the favour returned, there is an increased chance that other digital marketers will be willing to help you out.